Spinning is a heart-healthy workout!! The workout employs a stationary bike, which has various tension levels. 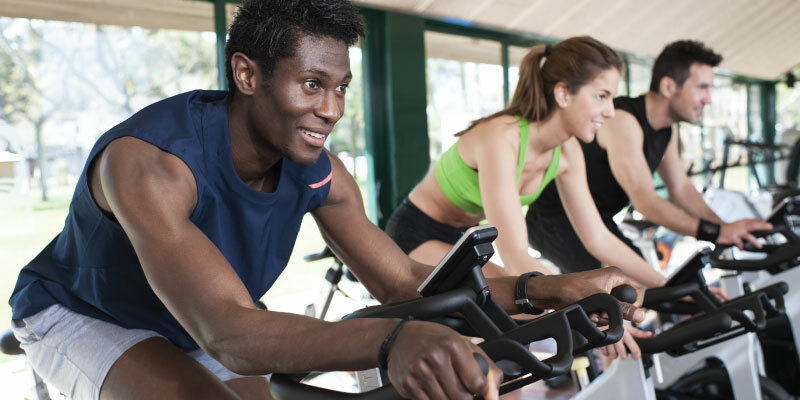 Spinning will enhance your speed, strength, and stamina, increasing heart rate and burning major calories! Unlike stationary bikes of old, spinning developed as a class in which certified spinners taught routines ranging from strength and endurance training to calorie burners. All fitness levels can enjoy this class as the tension levels can always be adjusted to what works for you and your body. Bikes are limited, check at your location for sign up policies. Heart rate monitors are recommended. New to Spinning? Arrive a little early for a class overview and personalized bike set-up.